This is my favorite review that I have done in awhile. I got the opportunity to review these awesome boots from CSN stores called the Capella Boots. 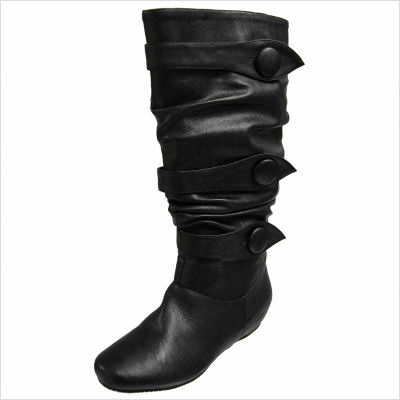 These boots can be worn casually or dressy. They have 1/2 inch heel so are very comfortable to walk around in. I wear boots about 6 days a week in the fall/winter so these boots will get very good usage! They fit very well too! I would wear them with a skirt, leggings, jeans, etc. These are from the Journee Collection and come in brown, chestnut, grey, or black. They retail for $48 and have free shipping right now because shoes ship free! The boots seem to be great quality too! Thanks CSN stores for providing me shoes to wear almost everyday! thanks for the follow. i'm looking forward to reading more of your posts. happy friday! Hi, thank you for stopping by my blog! I am now following you...I cant wait to read more of your posts! As a student nurse, nutrition is something we are always interested in to promote for our patients! Hope you have a wonderful weekend. I'm so happy you stopped by today! Now... really, are those boots truly $48? Wow. I had no idea CSN had shoes, how cool! Definitely glad it's the fall because the boots will be everywhere! Hello, thank you for stopping by my blog http://notyourgrandmothersavon.blogspot.com/. I am your newest follower! Great product review. I abolutely love these boots. They look so comfortable. Oh you just what I need -I'm your newest follower. Thanks for following me, I am following you as well.